Comm Eye Health Vol. 17 No. 52 2004 pp 57 - 58. Published online 01 December 2004. Corresponding author: Marcia Zondervan, International Centre for Eye Health, London School of Hygiene and Tropical Medicine, Keppel Street, London WC1E 7HT, UK. bringing about environmental changes, such as building and using latrines (E). The Trachoma Initiative in Monitoring and Evaluation (TIME) group was asked by the International Trachoma Initiative (ITI) to evaluate trachoma control programmes in 8 countries. Participatory evaluations were conducted in Africa (Ethiopia, Ghana, Mali, Morocco, Niger and Tanzania) and Asia (Nepal and Vietnam) by teams which included national programme staff and external personnel. A standardised methodology was used. The experience taught us some valuable lessons about what contributes to health promotion successes and pitfalls in trachoma control programmes. Monitor and evaluate health promotion efforts. When health education forms part of community life, the familiar processes can make messages more acceptable. We found that community meetings held in familiar surroundings such as churches, mosques, clubs and societies are valuable for discussing trachoma. For example, in Morocco, trachoma awareness is integrated into an adult literacy programme targeted at women; in Vietnam, the majority of women within endemic communities are reached through the Women’s Union. Where local cultural norms are not considered in the planning of SAFE activities, or where providers fail to approach communities in an appropriate manner, there may be resistance to the SAFE programme. We found in one village a total refusal to take up surgery. Gradually the reason for this became clear: the villagers felt that social norms had not been observed because surgeons had neglected to discuss their plans with village elders before inviting community members to have surgery. Once this was appreciated, and time taken to explain the need for surgery to the village elders, the embargo against uptake was lifted and interest in surgery was expressed. Efforts can be compromised if an inappropriate person delivers the message, for example, a man lecturing to women. Similarly, mistakes have been made when health education sessions were conducted in inappropriate places. For example, choosing to deliver messages to an intended audience of women and children at a public meeting place, only to find that women in the culture do not have direct access to such public venues. In such cases it makes sense to first find out where women traditionally meet, for example in Ethiopia, Morocco and Vietnam, trachoma control activities are integrated into existing women’s groups. Using a range of health promotion activities maximises opportunities for reaching the community and allows for the design of gender- and age-specific messages. The options are numerous and include communicating with the population at large (mass communication), communicating with targeted groups, and communicating with individuals on a one-to-one basis. 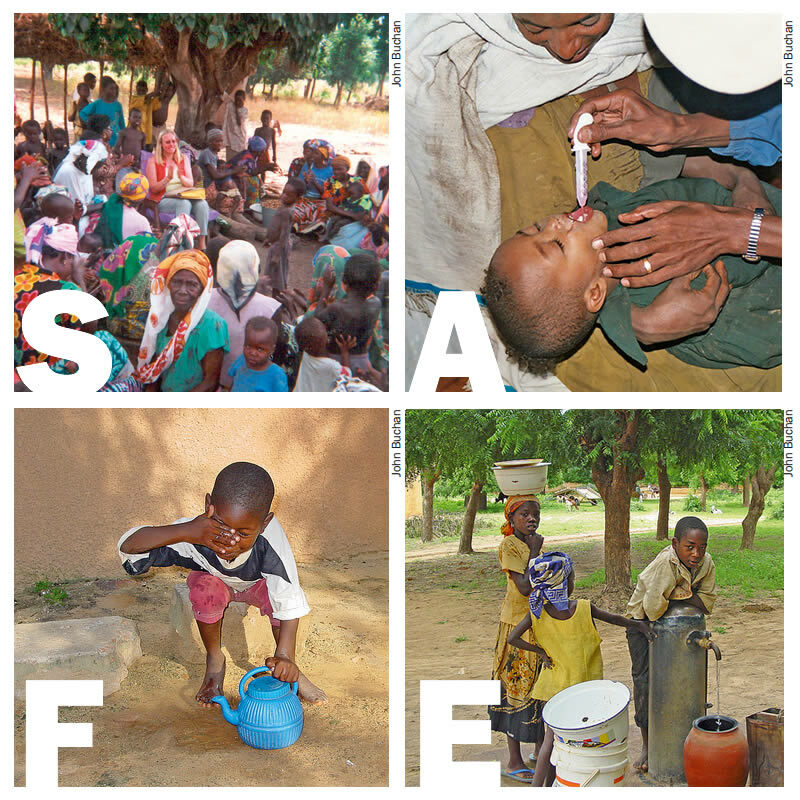 Mass media (posters, television, radio, films and videos) are popular means of transmitting simple ‘nuggets’ of information to raise awareness about trachoma. The BBC World Service Trust developed radio spots in local languages in several countries including Tanzania, Ghana, Niger, Ethiopia and Nepal. These trachoma messages went out several times per day for a number of months. In Ghana, we found that the trachoma song played on the radio was very well received and women and children in every village we visited could sing the song. In Niger the trachoma control programme printed fabric that people made into clothes. These activities are in tune with local cultural norms, and appeared to have improved awareness about trachoma. Education at health centres and clinics, often performed by nurses known to the community, can be carried out while people are waiting to receive treatment. Another opportunity is to link antibiotic distribution in the SAFE strategy with health promotion. For example, at an antibiotic treatment session in Nepal, we saw a demonstration of how people first pass by the well to watch a face- washing demonstration, then wash their own eyes and faces, and then go on to receive the antibiotics. Practical demonstrations like this can greatly enhance communication with groups, as many programmes have demonstrated in their use of the ‘leaky tin’ to show how children’s eyes and faces can be kept clean despite having limited access to water. While mass communication and communicating with specific groups is useful for raising awareness about trachoma, we found that one-to-one communication may be more appropriate for identifying and overcoming barriers, such as the resistance to trichiasis surgery. Individuals with trichiasis are a subset of the population who need more specific information, counselling and support. In Vietnam, action groups, composed of the village head, the village health worker and the head of the women’s union, are established in each village. These action groups visit each person identified with trichiasis, encourage them to have surgery, and help to make the arrangements to facilitate this. The programme decided not to use radio messages about trichiasis surgery because many sufferers do not identify themselves as having this condition and would probably not ‘tune in’ to such mass communication. Locally based communicators are important as they are known to their peers, and can be active promoting health on a day-today basis. However, local communicators need to combine their natural communication abilities with information and skills specific to trachoma control. We found that training of trainers is an effective way to improve the communication skills of people at grassroots level. In Vietnam, for example, district education officers trained the head teacher and health education teacher from each school in trachoma control programme districts. These teachers return to their schools and train the other teachers. We found two limitations to the effectiveness of locally based communicators: the lack of health promotion materials, and the difficulties of maintaining the enthusiasm and motivation of the communicators, many of whom are volunteers or combining the role with other jobs. One option is to provide monetary incentives, although this raises questions about the long-term sustainability. Another option is to provide opportunities for further education or improved status. In Tanzania, traditional dance groups were helped by district coordinators to make up their own dances and songs about trachoma. Dance groups were motivated by the enthusiasm and appreciation they received from the spectators, which gave them enhanced status in their communities. 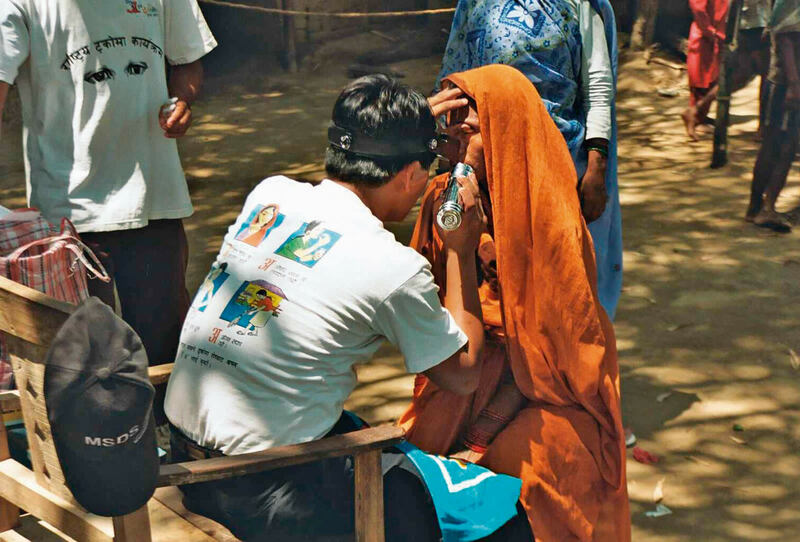 Trachoma education activities are often concerned with the importance of facial cleanliness and environmental change. There has been a lack of emphasis on explaining the link between trachoma and trichiasis and to encourage uptake of the “S” component. All the messages have to be tailored to meet the specific understanding of the target populations. The link between the different actions (clean face, improve environment, treat trachoma, receive surgery if necessary) needs to be explained so that people know that all of these contribute to preventing blindness from trachoma. Coordination of the various activities involved in implementing the SAFE strategy is of the utmost importance. Appropriate structures must be in place to ensure that messages and services are planned to work together so as to avoid disappointment to beneficiaries. For instance, if people are encouraged by a community educator or through a radio message to go for surgery and then find that surgery is not available at the indicated time and place, they may refuse further invitations to attend and their experience will have a wider influence on the reputation of the programme. The lack of robust indicators (other than crude process indicators such as the number of sessions given) is an important constraint to analysing the effectiveness of health promotion. Individual programmes must devise a set of indicators that are most informative for them. In Konso district, Ethiopia, a sanitation officer was employed to promote the construction and use of latrines. The sanitation officer was in regular contact with the community allowing the setting of goals, identifi- cation of indicators to track achievement of the goals, and monitoring of progress. This established both the means for evaluation, and the process of community engagement that resulted in community ‘ownership’ of the programme. Effective eye health promotion is the key to building the knowledge, skills and attitudes to bring about change within communities, so that we can achieve the goal of eliminating blinding trachoma by 2020. Key points that have emerged from our evaluation of trachoma control are the importance of establishing adequate support for community level workers, identifying, developing and encouraging dynamic local motivators, and setting structures in place to ensure delivery of appropriate and consistent messages which work in harmony with all components of the SAFE strategy.